The Quaker Tapestry itself existed 13 years before the museum but found it’s permanent home here in Kendal in 1994. 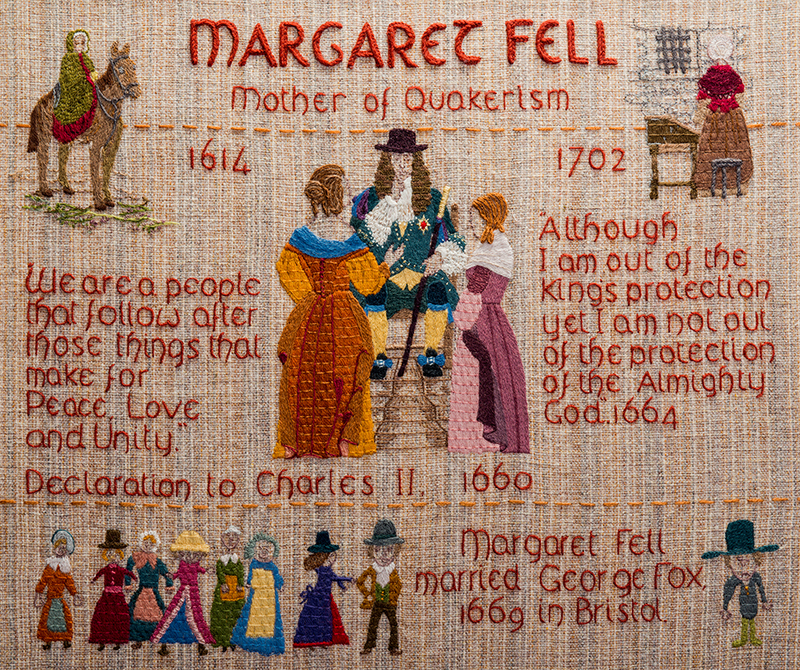 Many people ask us why is the Quaker Tapestry Museum in Kendal? Over the years the large Grade II* listed Kendal Meeting House became costly to maintain and was in need of modernisation. Local Quakers were reluctant to sell their historic building but finding a solution failed due to restrictions by the authorities. The Meeting House was eventually put up for sale but without success. In 1992 Kendal Meeting’s Clerk, Marion Winchester, suggested to the founder of the Quaker Tapestry, Anne Wynn-Wilson, that the Quaker Tapestry might find a home in Kendal. This would mean that Kendal Quakers could continue to use the premises alongside the museum. Quaker Area Meeting and The Tapestry Scheme set up a trust. An appeal for funds was launched and raised enough to refurbish the premises in 1993-1994. Quaker Tapestry Museum to open its doors in the spring of 1994.